Smith & Hanks company tagline is “Practical Luxury”. This Smith & Hanks 24 inch-wide 46-bottle wine cooler definitely represents their company motto well. You find many premium features with design sensibility for everyday usage in this wine cooler. Capacity and design: This Smith & Hanks 46-bottle wine cooler is built with stainless steel, metal plates and double-panned glass door. This beautiful profile integrates well with stainless steel appliances in the kitchen. This Smith & Hanks unit has a 46-bottle Bordeaux-sized capacity. With a standard width of 24-inch, this Smith & Hanks is a great built-in candidate for under-counter installation. Metal shelving: This Smith & Hanks has six wood-accented metal shelves. Each shelf resembles a tray with metal plates. The metal plates gives you more flexibility to store various sizes of bottles easily. Yes, you can store prosecco bottles with Sangiovese bottles on the same shelf. The wood accented shelf-facing provides a warm-element to the cool-looking stainless steel frame. 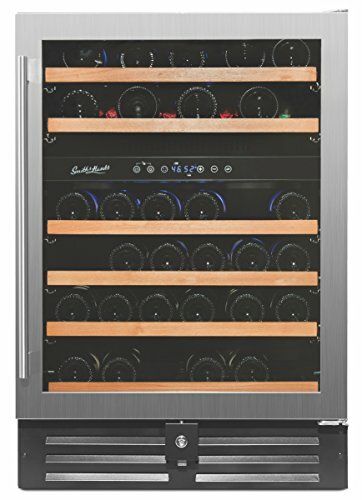 Dual temperature zones: This Smith & Hanks 46-bottle wine cooler has a dual zone cooling system. 41°-54° F in the upper zone, 46°-66° F degree in the lower zone. Dual-zone gives you options – you can set two separate temperature zones for your red and white vintages. Yes, keep your Beaujolais, Chardonnay, and Cabernet Sauvignon to Pinot Noir all in the same wine cooler. Tips: In general, store your white within a range of 40°-50°F, your red wine within a range of 55°-65°F. Digital temperature control: : The control icons are intuitive to use. Temperature up, temperature down, upper zone, lower zone, light on, light off. It is super easy to monitor and set up the desired temperature for each zone. Air Management System: Thanks to a well-thought-out air management mechanism that circulates humid air inside the cooler. You don’t have to worry about those corks get drying out. Temperature is super consistent with this Smith & Hanks 46-bottle. Note: Smith & Hanks uses only environmentally friendly refrigerant with no ozone depleting chemicals. Double-paned Glass Door: This Smith & Hanks 46-bottle is an energy-efficient unit. Contributing factors: This double-paned UV-shielded tempered glass door, a well-designed quiet compressor and quality manufacturing. Note: This door hinge is on the right. The glass door is not reversible – configure its installation location accordingly. LED light: This Smith & Hanks 46-bottle unit comes with a soft-lit interior LED light. You can turn it on or off using the digital control panel. Security lock: This Smith & Hanks unit has a built-in lock. If you have young children, you would appreciate this safety feature. 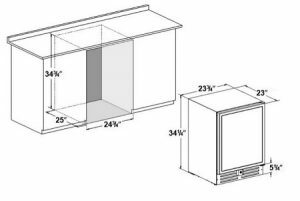 Warranty and support: All wine refrigerators by Smith & Hanks come standard with a 1-year warranty for parts and labor, 3-year warranty on compressor. Summary: This Smith & Hanks RW145DRE 24 inch-wide 46-bottle wine cooler (view on Amazon) is one of our top five 46-bottle capacity wine coolers. It is a “Practical Luxury” unit – beautiful and versatile. With its front venting, it can be installed as a built-in under-counter unit, or just as a free-standing. It is energy efficient – double-paned glass door and, quiet compressor. This Smith & Hank wine cooler is also one of our top five under-counter 24-inch-wide wine coolers. We like how seamless it blends with other stainless appliances in the kitchen. 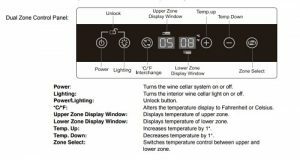 It is dual zone – the preferred cooling zones for diverse wine collectors. We also like its innovative wood accented metal plate shelving – to accommodate variety of bottle sizes. 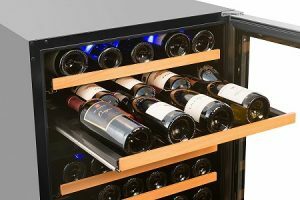 If you are gathering a list of top-rated 46-bottle wine coolers in your comparison shopping, include this Smith & Hank unit on your list of evaluation. Double-pane glass door, dual-zone, energy efficient, metal plate shelving, excellent warranty. Check out our featured list of 24-inch-wide under-counter wine coolers.